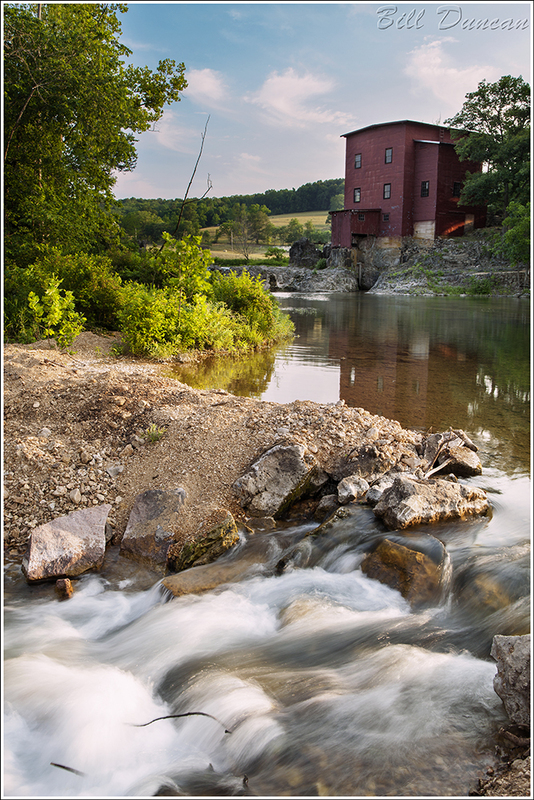 Part of my Missouri Ozarks grist mill series, this image shows the Dillard Mill in late afternoon light, watching over the Huzzah Creek as the small river works it’s way through a series of man-made impoundments. There has been a mill structure on this location since 1853, the current building was completed in 1908. This was the last stop of the day in a day trip Sarah and I took this spring. Although warm, the setting was perfect. The quaint, old, warm structure set against last years hay bales in the field immediately behind, the contrasts in water as it rushed down rocky barricades, stopping in motionless, clear ponds, and the chatter of birds like the Belted Kingfisher made us hate to get back into the car and take the drive back to the city. Love this!! I was here over the summer and while it was the middle of the day and the lighting was harsh for good shots we did get to see our first bald eagle of the season. We will be going back this spring for sure.